This school year, the Madeira Baseball Program will have its first ever 5k Fun Run. Come run, walk or simply join us after the run on Saturday, April 6, 2019. All ages are welcome! The Madeira Baseball 5K will start at 9 a.m. promptly. The course will begin at the Madeira Elementary School and wind through the neighborhood on the streets of Buckeye Crescent, Thomas, Rita, and Berwood, finishing back at the elementary school. After the run there will be additional fun festivities for all to enjoy. There will be raffles, giveaways, a wiffle ball home run derby (Prizes for the Winners), food and more. Also available will be an autographed photo of Andrew Benintendi's AP Play of the Year as well as some of his game worn items. Money raised at this event will go towards updating the current dugouts and purchasing training tools for the players. Or simply come the day of and bid on raffle prizes while enjoying the day. * Registration deadline to receive your shirt by the day of the race is March 9th! T-shirts can still be purchased after March 9th, however, they will not be ready by race day. Grand Slam Level: $1000 - Grand Slam sponsors will receive the largest amount of recognition for sponsoring. This includes a 4 x 8 banner. Grand Slam members will receive their name or company logo on signage that will hang at the field for the next three years. Also, Grand Slam level will receive a signed baseball from each member of the 2018 Madeira Baseball Team and have the opportunity to throw out a first pitch at one of our home games. Home Run Level: $500 - Home run sponsors will receive recognition as a co-sponsor on a banner and will share recognition on the outfield fence. *Walk up registration is available the day of the Race. Questions? 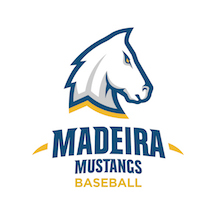 Contact Madeira Mustangs Head Baseball Coach Aaron Pfeffenberger @(419) 953-3656 or apfeffenberger@madeiracityschools.org.